retama negra, retama de escobas, escoba negra, Bie. retrama, L. Cytisus scorpartius (street sweeper), Spartium scoparius or Sarothamnus vularis, Eng. broom, Scotch broom, woodwaxen, greenweed. Retama is Hispano-Arabic for the Ar. rátam. The word first appeared in the 14 C Libro de la Montería by Alfonso XI, which advises that broom and egg whites should be added to an electuary. “Retama” was applied to some broom species. Others continued to be called genista or inesta from which evolved into xinesta. 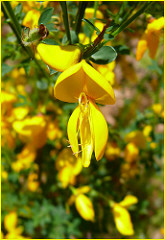 Broom or Scotch broom is the commonest shrub of the broom family. It’s bright yellow and brownish-yellow flowers bloom from February to July, depending on the location. In general today brooms are planted to prevent erosion and for flood control in warm climates and to fertilize the soil. Grazing animals cannot eat it as the interlaced branches prevent them to penetrating into areas where it grows. It is abundant in all the mountain ranges in Iberia from the Pyrenees to Portugal and most plentiful in Gredos (Avila) and the Sierra Nevada (Granada). It is found in nearly all of Europe and Western Asia. 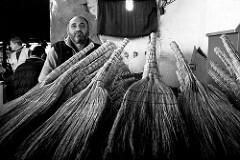 Broom does not grow on the Balearic Islands. It has been found growing at altitudes over 2,000 m. high. In the Bible, this shrub was used as fuel for the fire, to make arrows and the roots were eaten as food. In the 15 C. the poor collected the shrub by the cartloads and sold it in London at four pence a bunch. Although principally it was used as kindling, the twigs and branches were tied together into brooms or to make cordage and sacking. The flowers were used to dye cloth and paper brownish-yellow.